From repairs and maintenance to service and installation, SMO’s highly trained NATE-certified technicians and installation team will make sure your home comfort needs are met with courteous customer care, efficient service, and top industry training to get the job done right the first time. SMO Energy has been a family-run and locally-operated business in La Plata, Maryland for over 90 years. We service the Southern Maryland region, Anne Arundel County, and Prince George’s County. You can rely on us to provide you and your family with dependable and caring service. We provide maintenance and service for all types of heating and cooling equipment, including heat pumps, air conditioners, furnaces, boilers, water heaters and gas fireplaces. Whether, your current equipment is in need of repair or complete replacement, turn to us for assistance in finding a home comfort solution that fits your needs and budget. Our Technicians undergo an extensive 2,700 hours of ongoing training every year and are all NATE-certified. NATE is the only closed book examination for technicians in the industry, and tests working knowledge of all HVAC equipment. We run an in-house HVAC training facility and employ a full-time technician trainer. Our technicians are uniquely qualified to service oil powered boilers to the most high-tech industry innovations. 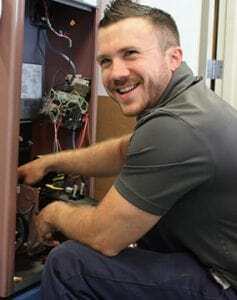 To ensure our technicians are knowledgeable and efficient, we turn to NATE for third party certifications to continually test the working knowledge of all our technicians. Our technicians provide tune ups with the outstanding customer service. They take the time to address any concerns or questions you might have about your heating and cooling equipment. During your HVAC maintenance, our technicians follow a comprehensive checklist to thoroughly inspect, clean, tune up, and run your equipment. Depending on your equipment type and the condition, this process takes approximately 1.5 hours. Annual maintenance on your heating equipment and cooling equipment will ensure your equipment operates at peak performance, prolongs the equipment’s life, and will ultimately save you money on operation costs. We know purchasing new heating and cooling equipment for your home is a big decision. At SMO we make this process easy. One of our energy consultants will visit you at your home to help you choose the equipment that is best suited for your home comfort, equipment size, and budget needs. Our energy consultants will review the entire installation process, as well as offer affordable payment options, like our 0% in-house financing for well-qualified clients. When it comes to selecting a repair company for your HVAC equipment needs, make sure your technicians are NATE-certified. All of SMO’s service technicians hold current NATE certifications and have extensive HVAC knowledge to repair your heating and cooling equipment efficiently. Our technicians specialize in repairing heat pumps, air conditioners, mini splits, oil and gas fired boilers, oil and gas fired furnaces, oil, gas and electric water heaters, tankless water heaters, gas fireplaces and more. SMO offers 24/7/365 Emergency Service to get your equipment fixed quickly. We always have a live representative to answer your call, no matter what time of day. SMO’s service technicians undergo 2,700 hours of technical training and are all NATE-certified. NATE is the only closed book examination for working knowledge of HVAC systems in the industry. Purchase the HVAC equipment that you need now and pay over time. SMO offers 0% in-house financing for up to 36 months for well qualified clients. Annual maintenance tune ups keep your equipment operating at peak performance and save you money on operating costs. Maintenance also prolongs your equipment's life. Our NATE-certified technicians perform annual tune ups, prime and starts, and safety propane gas checks. Unexpected repairs and part replacements can be an unexpected, costly expense. Protect your equipment with a service agreement and receive a free annual tune up, parts and labor coverage, and 24/7 emergency heat service. Whether you need your HVAC equipment repaired or replaced, our trusted professionals will help you make the decision that makes sense for your home comfort and budget needs. Get started with a free in-home energy consultation to get your free estimate. Schedule your home’s HVAC equipment service with Southern Maryland’s trusted heating and cooling provider.